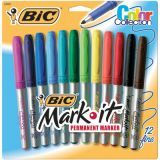 BIC® Brite Liner® Highlighter Set, Fluorescent Colors, 6/pkg"
A multi-purpose highlighter for photocopies, computer reports and more. 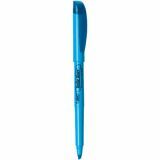 Chisel tip point for broad or fine line application. 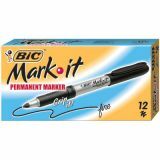 Water-based ink." 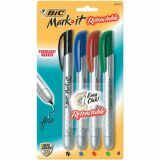 BIC® Brite Liner® Retractable Highlighter Set, Fluorescent Colors, 5/pkg"
Seal Guard Defend Against Dry Out/. 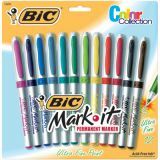 5 color set - pink, blue, green, yellow, and ornage.Key Benefits:/ Pocket highlighter/ Chisel tip for broad-line highlighting or fine-line underlining/ Bright fluorescent inks/ Good resistance to lightEnvironmental benefits/ Water based ink/ PVC free product"
BIC® Mark It Permanent Marker, Black, Dozen"
Rubberized grip for comfort and control. Vivid, quick drying ink resists water. Marks on glass, metal, coated paper, photos and plastics. Long cap-off life. 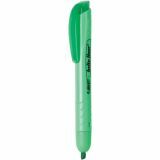 ACMI Certified non-toxic." 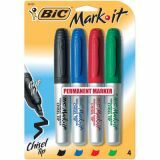 BIC® Mark It Permanent Markers, Chisel Tip, Assorted Colors, 4/pkg"
Tank-style permanent marker with chisel tip for broad and fine marking. 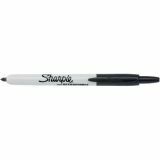 Fade-resistant ink that marks on most surfaces, such as plastic, metal, glass, cardboard, wood, photos, oily and damp surfaces, and more. Ultra comfy rubber grip for comfort and control. Acid-free ink. 4 color set. Assorted colors." 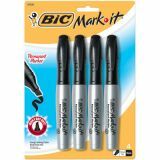 BIC® Mark It Permanent Markers, Chisel Tip, Black, 4/pkg"
Tank-style permanent marker with chisel tip for broad and fine marking. 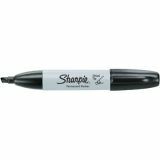 Fade-resistant ink that marks on most surfaces, such as plastic, metal, glass, cardboard, wood, photos, oily and damp surfaces, and more. Ultra comfy rubber grip for comfort and control. Acid-free ink. 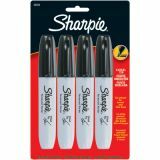 4 Black markers." 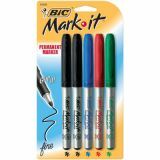 BIC® Mark It Permanent Markers, Fine Point, Assorted Color, 12/pkg"
12 assorted markers with fine point./ Permanent on most hard-to-mark surfaces such as glass, metal, photos, foils, coated paper, and most plastics/ Long-lasting, durable permanent marker/ Ultra comfy rubber grip for comfort and control/ Fade-resistant, vivid ink/ Acid-free ink"
BIC® Mark It Permanent Markers, Fine Point, Assorted Colors, 5/pkg"
5 assorted markers with fine point./ Permanent on most hard-to-mark surfaces such as glass, metal, photos, foils, coated paper, and most plastics/ Long-lasting, durable permanent marker/ Ultra comfy rubber grip for comfort and control/ Fade-resistant, vivid ink/ Acid-free ink"
BIC® Mark It Permanent Markers, Ultra Fine, Assorted Colors, 12/pkg"
12 assorted markers with ultra fine point./ Permanent on most hard-to-mark surfaces such as glass, metal, photos, foils, coated paper, and most plastics/ Long-lasting, durable permanent marker/ Ultra comfy rubber grip for comfort and control/ Fade-resistant, vivid ink/ Acid-free ink"
BIC® Mark it® Retractable Permanent Markers, Assorted Colors, 4/pkg"
Convenient easy click retractable permanent marker/ Bold, long-lasting ink with durable fine point tip/ Seal Guard Defends Against Dry Out// 4 Assorted Color Pack Colors:/ Black/ Red/ Blue/ Green "
Black Sharpie® Chisel Tip Permanent Marker, 4/pkg"